Sweater season is here, thus the Serenity Sweater was born. I am a huge fan of the high waisted, floor length skirts, with a cropped sweater, or paired with some nice skinny jeans. With that in mind I started on this crochet Serenity Sweater. I made mine with a cropped look, but you can choose to make yours full length if you so please. The yarn I ended up using has a gorgeous blend of colors that I am in love with *happy sigh*. The back of the sweater is a deep V with a single chained strap across the back to help keep the sweater firmly in place on your shoulders. I hope you all enjoy this sweater as much as I do! This is more of an intermediate pattern but I am happy to help any beginners who want to attempt! I would love to see what this pattern looks like in all the colors and yarns! Tag me in your finished projects or even if its still a work in progress and I may feature your project on my social media accounts! If anyone has a suggestion for any new patterns feel free to tag me or DM on my instagram at anytime. Also if you get stuck on a pattern at any time, just find where I posted that pattern photo on my Instagram and leave a comment with your question. This allows me to know exactly what pattern you are asking about, and it may help out someone else so has a similar question! I will respond as quickly as I can. Thanks loves! Buying Crochet Supplies Pro Tip: If you purchase any of your craft supplies at Joann Fabrics like I often do, then you should really consider getting the Ibotta App on your phone. They have 10% cashback coupons for Joann’s as well as other cashback opportunities on certain yarn brands like Big Twist. They also have lots of other retailers on there but I pretty much only use the Joann rebates. I have gotten over $100 back from just buying things I would have bought anyways by scanning my receipt in the Ibotta App. You can have the money sent to your paypal or use it to get gift cards (Joanns, Applebees, etc). Yarn: I used approximately 2 skeins (328 yds/200g each) of Loop and Threads Barcelona in the color in Arctic for my serenity sweater. If you plan on adding length to the sweater or increasing the width a few inches, you will definitely want to grab a third skien (or get 100-200 more yards of yarn if you use a different brand). This is a bulky (5) weight. Each skein had 328 yards (300 m) and weighs 7oz (200g). If you use a different brand/type of yarn, try to get something in the same weight and density. Meaning something that is roughly the same weight per yard. Crochet Hook: I used a 10mm clover brand hook for this pattern which was a larger hook size than my yarn suggested. 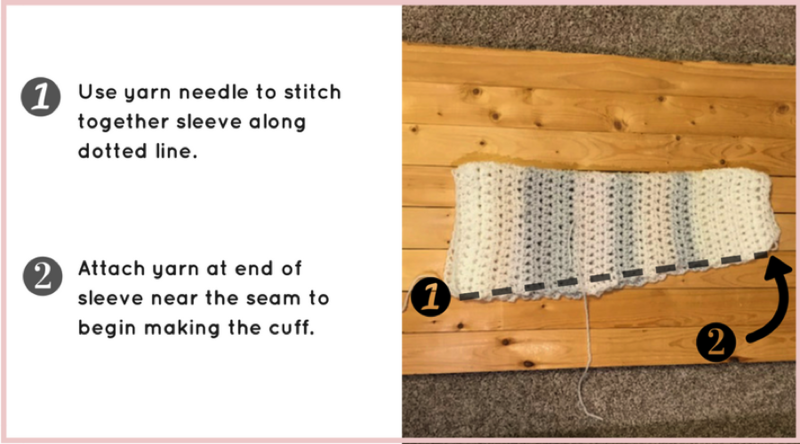 Single Crochet (SC) – Insert hook into next chain/stitch and pull up a loop. YO and pull through all loops on hook. Half Double Crochet (HDC)– Yarn over hook, insert hook in stitch, pull up a loop, making 3 loops on the hook. YO and pull through all loops on hook. Front Post Half double Crochet (FPHDC) – Check out this video tutorial by Hopeful Honey to see how to do this stitch if you are unfamiliar. 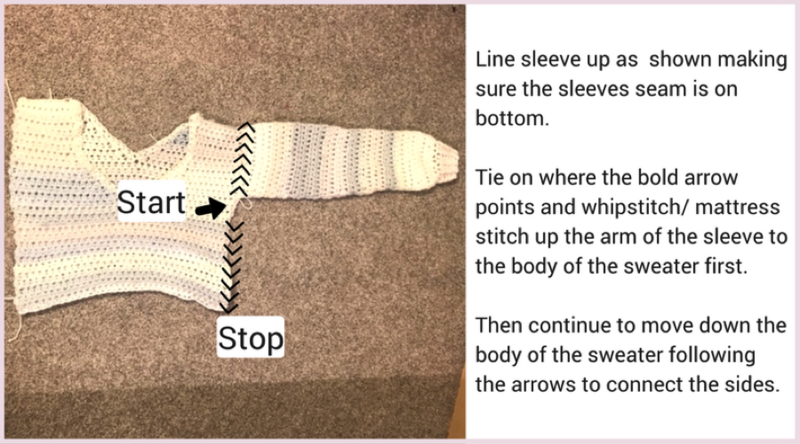 Back Post Half double Crochet (BPHDC) – Check out this video tutorial by Knittinghelp.com to see how to do this stitch. This sweater can be altered to fit any size and body type. I will tell you in what areas you will want to adjust it to make it larger or smaller. I made mine in a M/L size. For reference I am a size ten pants and size 8 top in general. Chain 2 at beginning of each row does not count as first HDC stitch. For a large, this top measured 19″H X 19″W. With the sleeves being 25”L. A small would be 19”Hx 17”W. Sleeves still 25”L. If you would like to increase/decrease the Width to make it fit to your preference, the gauge is 8 HDC stitches per 4”. Adding/deducting 2 stitches will increase your width by 1 inch. To alter the height every 3 rows added or deducted will increase/decrease the length of the sweater by 2”. The following will be written with the sizes as follows S (M/L) and other instructions will be added throughout to help further increase or decrease the size if these two size options are not the right fit for you. **Repeat alternating rows of 16 and 17 until you complete to Row 23. -or however many chains you used for the back panel if altered. Tie back onto the unworked end of row 22 (Just like you did for the back panel). Repeat rows 22-31 and tie off. Now you will want to use your tapestry needle to attach the front and back panels making sure the seam is on the wrong side of your work. The picture below shows you where you connect them at with step 1. 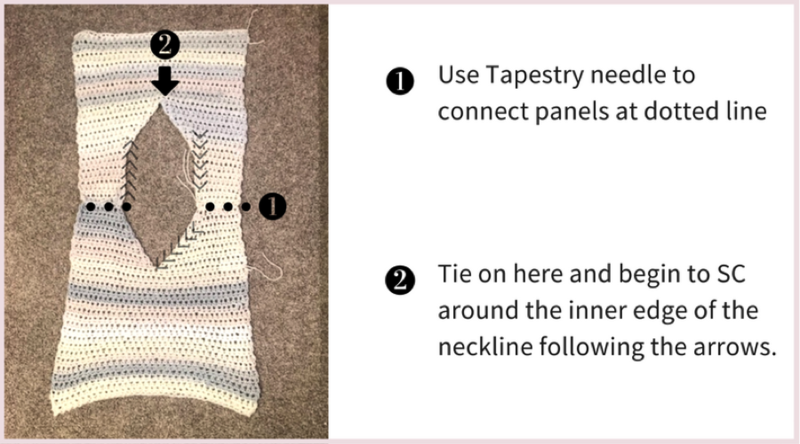 Use a mattress Stitch or a Whip Stitch to connect the panels to shape your serenity sweater. Then you will want to attach your yarn where the arrow points for step 2. 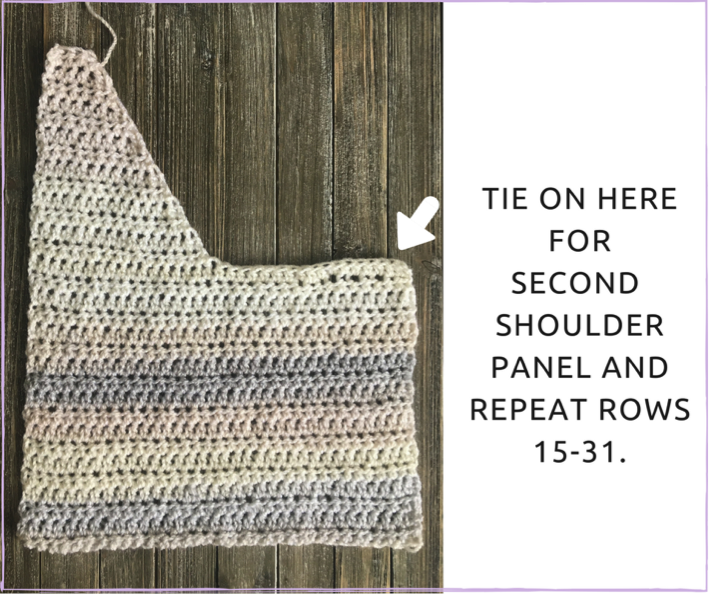 You will SC as evenly as possible (1 SC per row seemed to work well for me) around the entire neck hole you made in the previous step. When you reach where you tied on, connect with a slip stich. Ch 12 and connect with a SC on the opposite side in the same Stitch. Meaning if you stopped two stitches short of the seam, you will attach it to the other side of the panel 2 stitches below the seam. Again SC back down the edge, following the directions of the arrow and SS to the first SC of row. Tie off. Below is a picture of what the back should look like after this step. Try on sweater panels at this point to check length and back chain placement. If you want to add length to the body of the sweater you can just attach your yarn at the bottom of the body and add additional rows for the front and back panels. For increasing sleeve size to make a larger size than I have listed, add additional Chains to foundation chain and follow the pattern accordingly from there. Note number of starting chains for second sleeve. CHECK LENGTH OF SLEEVE AT THIS POINT FOR PREFERENCE. TAKE OUT 1-2 ROWS TO SHORTEN SLEEVES, OR ADD ADDITIONAL ROWS FOR LENGTH. Fold sleeve in half hotdog style. Using your long tail and tapestry needle, whipstitch/mattress stitch along the edge forming your sleeve. See step 1 below. Tie on to the end of the sleeve where arrow indicates in step two above to begin making the cuff of sleeve. Using the photo below as a guide. Line up your sleeve to the body of the sweater wrong side out, seams aligned. Begin to attach the sleeve all the way around the body of the sweater before moving to seaming down the front and back panels. Repeat for second sleeve on other side. Tie off. Weave in all ends. One of my beautiful testers added ribbing (like we did on the cuff) along the bottom of her serenity sweater and it looks amazing! She did 5 rows of the FPHDC/BPHDC around the bottom edge of the body. It helps bring the sweater in to hug your body just a little bit more instead of hanging loosely as it does in my photos. 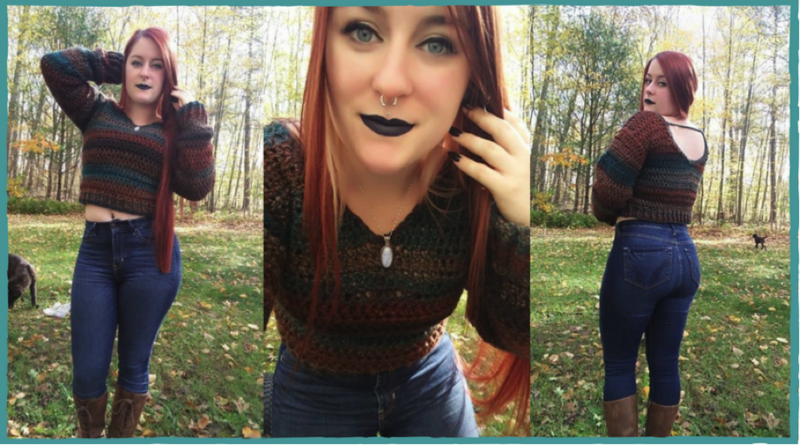 Here is a picture of my gorgeous tester Christina (shiver_me_stitches on instagram) in her sweater! Turn your project right side out and your project is complete! Now you can go show off all your hard work and watch the requests from friends and family (and strangers!) flood in with wanting you to make them a Serenity Sweater! The cropped version works up pretty quickly which means you have quite a bit of time to make some for Christmas gifts for a few of your favorite friends! Or if you are like me, you can make just this one for yourself before getting distracted and moving onto your next project. Please do not hesitate to reach out if you need any help on this serenity sweater pattern! Also, if you would be willing, I would love for you to share your finished projects (and wearing them!) on my blog’s Facebook Page! Or if you post on instagram tag me (@TaylorLynnCrochet) so I can see how awesome they turned out! The social media icons in my header and side bar are all linked right to all of my accounts! Thank you so much! 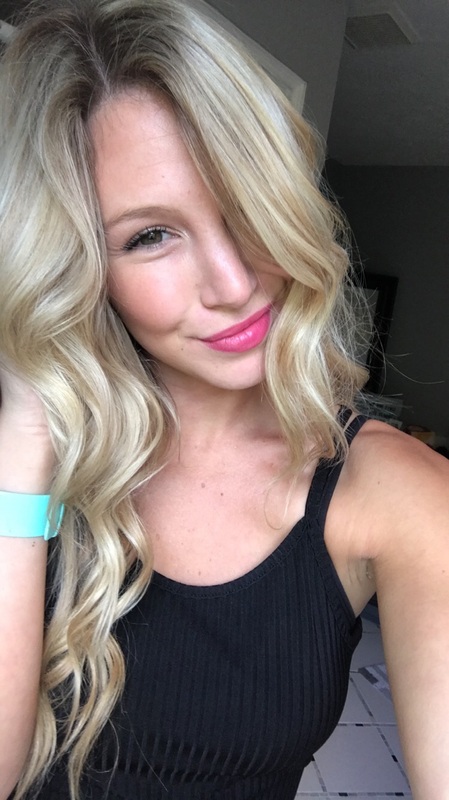 If you have any suggestions for future or tutorials please comment below! I hope everyone feels the same way, Thank you! I think this is the cutest sweater I have ever seen in a pattern. I am a bit longer and need a full length however, I can’t wait to start this after the holidays. Merry Christmas to you and yours. Thank you for the pattern! Merry Christmas to you as well! I Can’t wait to see your finished project! Love this sweater, my problem is I can not get the gauge right. I am ending with fewer stitches. Went up a size in hook, end result, fewer stitches. If you have any suggestions I would love the help. I dont think being a stitch off on gauge will really make too noticeable of a difference. If it were me, I would go with whichever is closest or the lower hook size. I hope that helps! Thank you for the help. Love your beautiful work and thanks for the free patterns!! Hi thanks for sharing your great looking sweater. Beautiful sweater great easy to follow directions and a lovely talented model. I can’t wait to start this sweater. Since the nights still can be a little chilly in the evenings I am going to swatch with some bulky cotton yarn to see if that will work. If not then I will make it in the same yarn you used to make yours. Thanks for having a link to purchase the yarn that makes it easier then looking around for a site that sells it.